Here's a loud statement! 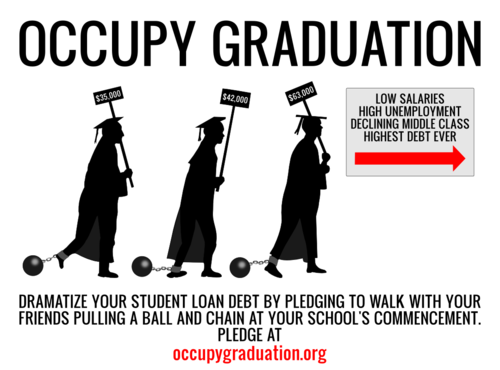 Student's participating in Occupy Graduation are sending a clear message by writing the amount of their debt on their caps, or even more striking, on a ball and chain! A handful of student activists are expressing their displeasure at the rising cost of college by wearing inflatable ball and chain accessories over their graduation robes. The props state the amount of debt with which they're graduating. The silent commencement protest, dubbed "Occupy Graduation" by its organizers, is taking place at seven universities around the country. "A college education is so important and now it's only available to people who have a lot of money or to people who end up going into debt for the rest of their lives," Cohen told Yahoo News. The entrepreneur never completed college, but he thinks it's crucial to job success today. Everardo Gonzalez, a 23 year-old criminal justice graduate of San Francisco State University, said he received "a bunch of positive feedback" from parents and fellow students for his participation in the quiet protest last Saturday at the graduation ceremony. Gonzalez is graduating with $26,490 in federal loans and another $10,000 in credit card debt that he racked up while trying to make ends meet. His parents couldn't afford to help him pay for college, so he worked at a local IKEA, struggling to balance his class schedule with his job. During Gonzalez's college career, San Francisco State University cut faculty salaries across the board, laid off staff, dramatically reduced the number of classes offered, hiked tuition and trimmed enrollment, all in response to the reduction in California's higher education budget. Gonzalez was forced to spend another year at school--and take out more loans to do so--after he couldn't find a way into the classes he needed for his major to graduate. (The crowded classes would fill up online within seconds.) The experience spurred him to join a group of student protesters linked with the Occupy Wall Street movement, who demonstrated against the cuts and other issues this year. Gonzalez has landed a paid internship for next year, and plans to get a master's degree in political theory after that to become a teacher. Gonzalez' debt load is actually about average for graduating college students who took out loans. By attending an in-state school, qualifying for grants and relying solely on federal--not private--loans, Gonzalez has a manageable amount of loans with comparatively low interest rates. "I'm not the poster child of student debt," he says, but adds that many of his friends are in a worse position. He believes college education should be free, and that existing student loans should be forgiven. Seeing his parents lose their home after the recession hit also made him passionate about advocating for more opportunities for middle class and poor people. "The entire system is set up for people to fail unless they're privileged," he says. Ivonne Quiroz, another San Francisco State University protester who graduated with a degree in biology last weekend, was also forced to stay at college for an extra semester after the immunology class she needed to graduate filled up. She's now walking down the aisle with about $21,000 in federal loans. Quiroz said the budget cuts also fueled her protest. "We're paying so much more, but we're getting so much less," she said. Another protest is planned for Hunter College in New York at the graduation ceremony on Tuesday. Monica Johnson, a 35-year-old Hunter College graduate student who's helping to organize the demonstration, borrowed about $15,000 in federally secured loans 15 years ago to pay for college. But in 2007, she decided to move to New York to get a masters of fine arts degree at Pratt, a private school. She took out an additional $60,000 in loans, which ballooned to $88,000 after she dropped out of the program, dissatisfied. She now has a full-time job at an arts non-profit and is enrolled at the much cheaper Hunter College, where she'll receive her MFA in December. Johnson recently paid off $18,000 of her debt over a period of eight months, by subsisting on peanut butter and jelly sandwiches and only paying for things in cash, which she said helped her resist buying anything unnecessary. She's encouraging indebted graduates to form a union and negotiate with lenders to get lower rates or income-based repayment. "What really pisses me off is I should never have been given those loans," Johnson said. "It honestly was the worst money I ever spent."